Adding flavour and depth to your main. You’ll thank me for this when you dine. The deep, bloody scarlet of sin. Of your cooking will win you renown. Dinner’s ready! Now what a relief! There’s no denying that these are slow months. Feast-weary and diet-starved, eating out holds less attraction for most; the garden gives only the slow, iron creep of green leaf, brassica and root, and even the gas emerges slowly from the frozen pipes, bursting reluctantly into flame. A perfect time, then, for slow, nurturing cooking. That could mean a stew, a casserole or hotpot or daube puttering slowly in or on the back of the oven; it could mean a basket of bright Sevilles transmuting slowly into jewelled glass. For me, this year, it mainly means fermenting things. At the last count, I had fourteen pots, buckets, crocks and tubs of (mainly) vegetable matter, being gradually colonised and transformed by bacteria. A mash of green chillies, gathering flavour before their vinegar bath; a souring julienne of roots and stalks; pungently spiced cabbage bubbling under airlocks; a foul-looking bucket of squid trimmings and guts. On the more experimental side, there is a vat of sweet honey-water that may or may not attract enough wild yeast to turn into alcohol, and a jar of brined radicchio that probably won’t, now, reach a pleasant eatability. All these things and more require almost daily attention or at least awareness, to be alert to the first sign of mould or rot or, equally, deliciousness; you don’t want your pickle passing its peak before it even gets jarred. While there is, I suppose, a certain fascination in watching all this happen, the main payoff comes when your ferments are ready – which won’t be for a while. These things take time, especially in cold weather. Luckily, winter is full of instant gratification too, if you look for it – crisp salads of fennel and blood orange and chicory and nuts, or warm ones of roasted brassica, lentils and cheese; steaming, boozy pots of mussels or clams, or spitting pans of squid. All wonderful things that barely need a recipe. Slice Florence fennel and segment the juiciest Sicilian oranges, and combine them with the aid of sweet vinegar and bitter oil, and you have one of the world’s perfect dishes. How is it John Lanchester has it? “A taste that exists in the mind of God”. I can’t remember what he, or rather his narrator, is talking about. My dinner last night was Romanesque cauliflower, roasted in thick slices with black pudding, tossed with braised lentils, shredded confit chicken, red onion and lettuce, dressed with olio nuovo and some vinegar from a jar of jalapenos; easy for me, because I had all of those things cooked or ready to hand. From scratch, a bloody faff of a recipe that probably wouldn’t be worth it. Still, you get the idea. We need something to keep us occupied while our slow food takes its time. You probably remember (ha!) how my rabbit ragout (my slowest recipe, I think) leaves you with spare saddle fillets; here, finally, is what to do with them. You are WELCOME. You’ll need a smoker, or some kind of tray-rack-lid contraption that does the job. How much this makes depends on how many rabbits you had in the first place. It is very adaptable. Take the fillets, which should be a little tacky after drying (this is called the ‘pellicle’, I don’t know why) and roll them in the pepper to coat. Shake them gently to remove the excess, and arrange on the rack of your smoker so they aren’t touching. If you don’t have extraction, open a window. Put the tea and spices in the bottom of the smoker, drip tray (if there is one) on top of that, then the rack, and then the lid, or tinfoil, leaving a small gap. Place on a high heat until smoke starts to wisp out, then close the gap and smoke on a medium heat for ten minutes. Take off the heat and leave for another ten before taking the lid off. The ‘pastrami’ can now be sliced thinly and served with, say, sweet-pickled cucumber and rye crispbreads, or sauerkraut and cheese, or whatever; if you make tiny bagels to put it in, please send me pictures. One of my favourite phrases in modern food writing is, appropriately, found in probably my favourite cookbook, Fergus Henderson’s Nose To Tail. In a recipe for a kind of stewed sauerkraut, he asks the cabbage be cut with a “good big knife” – an excellent three words, suggesting that the goodness of the knife is inextricable from its bigness; which, of course, it is. Sharpness he doesn’t feel the need to mention – that’s there in ‘good’. 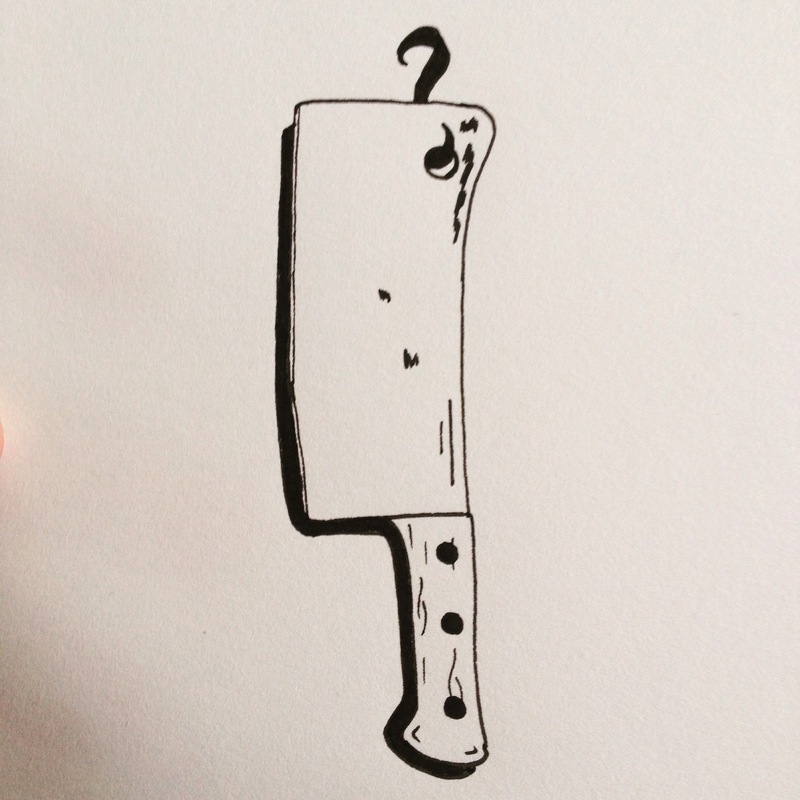 It’s easy to think of big knives as the protuding egos of (often male) chefs, or, more charitably, as something desirable in a professional but unnecessary in an amateur situation; this is true, perhaps, in a way – but only in a way. The thing about a large knife is it doesn’t just let you do things faster, although it does do that – slicing an onion, to take the most obvious example. There are also things which a good big knife allows you to do much better. Slicing that cabbage, for example, especially if you have a particularly large white, or one of those flat wide ones meant for stuffing, slicing it good and thin, is very difficult without a knife at least eight or ten inches long, with a wide blade to keep your knuckles from hitting the board. Chopping herbs well and finely, in sufficient quantity to be useful as a flavourant rather than just a garnish, is something that can only be done with a large knife – or a mezzaluna, I suppose, but if you’re going to buy one of them you may as well just buy a knife. You know all this, I’m sure. Everybody, or at least everybody with an interest in cooking, which, presumably, you do, knows this; but the point is that acquiring a knife and the skill to use it is not just a technical achievement – it allows you to cook different things, and to cook them differently. It broadens your mental palate (palette?). The whole wok-driven side of Chinese cuisine, as Bee Wilson persuasively argues in Consider The Fork, rests on the knife skills required to chop things into tiny, uniform pieces, using one of those gigantic cleavers; if you’ve ever seen Eat, Drink, Man, Woman, you’ll realise the control and strength required. Or, I’ll repeat, herbs – you can’t use herbs as they should be used, as great fistfuls of bright, green freshness, without a good knife. Don’t use those ridiculous 30g packs from the supermarket, either. Get a large bunch of parsley from a greengrocer, a market stall, or your Local Ethnic Food Emporium, pick the leaves off, put the stalks aside for flavouring stock, sauce, soup, pulses, or pickles; get your good big knife, and make this. Finely chop the parsley. Some mashing is acceptable and even desirable, so this is a good recipe to practice chopping on. Go over and over the herb with your knife, until it is very fine. Put in a bowl. Finely chop the garlic, sprinkle over some salt, and then crush to a paste with the side of your blade; this is very satisfying. Add the garlic and the capers to the bowl; chop the cornichons, fairly roughly if you like, and the anchovies, if you’re using them, and put everything in the bowl. The amount of oil you add depends on how saucy you want your sauce; I often keep it quite dry, capable of standing up by itself, for topping fried or grilled things. If you’re stirring it into soup or ragout, you might want it a bit sloppier. It’s your sauce.